"ONCE THIS HAPPENED TO ME…"
Very soon a long-awaited book - the autobiography of Italian artist will be presented to all the fans of Robertino Loreti!! 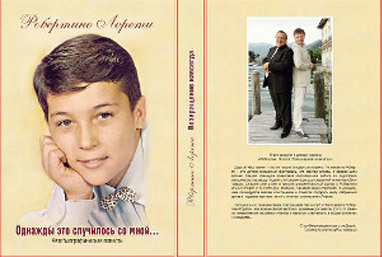 The book was called “ONCE IT HAPPENED TO ME.…”, had been completed by the author and prepared for publication in January 2012 year. In the frames of the project Robertino Loreti: Return to forever, the carrying out of a large-scale presentation of a long-awaited book-autobiography “ONCE THIS HAPPENED TO ME…”, This book will narrate the reader one of the mysteries of the 20th century of the formation and life of the legend. The project Robertino Loreti: Return to forever has the contract for exclusive publication and distribution in Russia, the CIS countries, and all over the world. Based on the book “ONCE IT HAPPENED TO ME.…” the script will be written and a feature film will be made. You have a unique opportunity to reserve your own copy of the book, just leave a request on our site.